I don’t know about you, but when cabin fever starts setting in, I start to really notice all of the disorganization around my house. It’s easy to ignore during warmer months when I am always out and about doing one thing or another, but when I find myself barely leaving the house and staring at the same piles day in and day out like I do this time of year, it starts to get to me. And this year one of the problem areas that keeps catching my attention is in the kitchen – specifically, my overflow of seasonings. 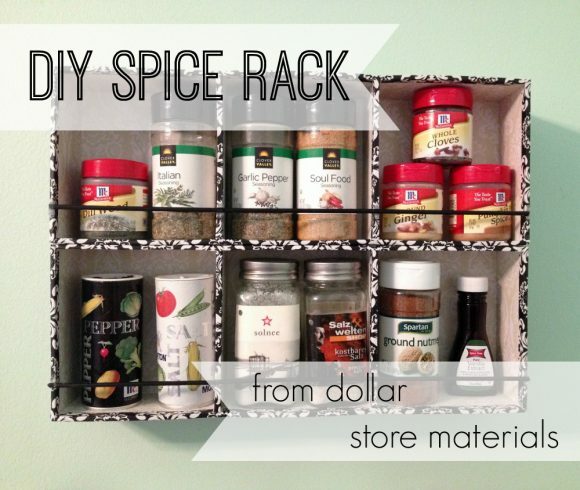 So, with the help of Dollar General, I decided to put together a little DIY spice rack! 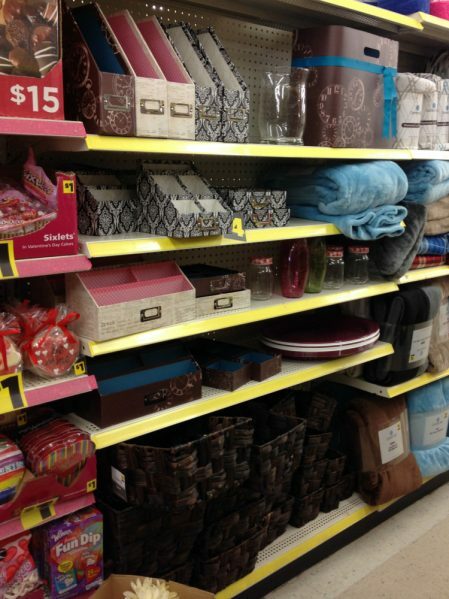 The folks at Dollar General must be thinking ahead to spring cleaning already, because my local store has recently received a whole bunch of really cute storage-y stuff in various sizes. Between their selection of gorgeous cardboard desk organizers and various sizes of chunky baskets, there is something here to hold just about any little tidbits and unsightly clutter you have around the house. In particular, I was drawn to some cardboard organizers each consisting of three squares. They had several different patterns, and I thought the pretty black and white damask print would look nice in my kitchen. I was pleased to discover that the sections of the box were just the right size to hold the Clover Valley herbs and spices that Dollar General sells. The spaces weren’t quite big enough for the taller bottles of seasonings in my collection, but knowing that I had lots of the smaller size seasonings at home, I decided to go with it. For larger bottles, you can always keep an eye open for similar divided containers that have taller sections (nice silverware drawer organizers, for instance, might be another option). I used two of the containers stacked together to make my spice rack. Of course, you can use any number you like, provided that you make it strong enough! But we’ll get to the reinforcing bit in a minute. First, we need to glue these babies together! I applied glue to the long side of one of my boxes, then press them together. I also clipped mine together with binder clips while I waited for the glue to dry, just to be certain I got a good, tight bond. Next, cut bamboo skewers to the right length to make a rail across the front of each row of spices. My skewers were a little short to make it all the way across with one skewer, so for each row I cut down two skewers and pieced them together to make the rails. Paint the skewers in a color to coordinate with your spice rack if you so desire, then glue them into place across the bottom of each row. Now to add hanging hardware. If you have picture hangers or other hardware on hand that will work, you can of course use that. I wanted to use what I had on hand, and while my first instinct was to go buy a saw-tooth picture hanger, I decided to try the ol’ soda can tab trick instead. I glued two soda can tabs to the back of the rack near the top, then waited for the glue to dry. The tabs should be placed in such a way that the part touching the rack is the curved portion, so that when glued in place there is a slight gap between the loopy bit at the other end of the tab and the back of the rack. The lady who taught me this trick years ago had been doing it since the 70s so I can’t take credit and I know it’s nothing new, but when I learned it, it blew my mind. Just nail (or in this case, glue) a soda can tab onto the back of anything and presto! It’s ready to hang! Whoever first thought of it was a genius and I wish I could thank them! But first… More reinforcement. More is definitely better in cases like this! So I duct taped the everlovin’ daylights out of my soda tabs. And when you think you’ve taped it enough, add a little more tape for good measure. You can’t be too careful with these things. 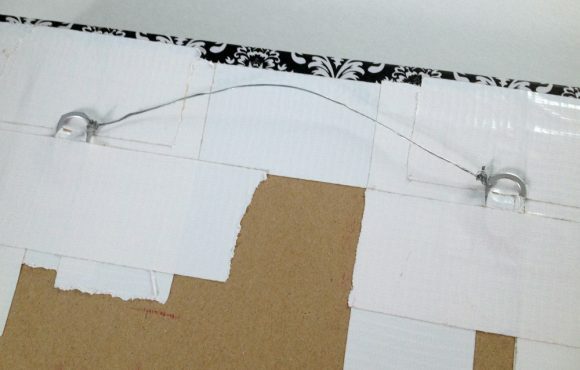 Then, I tied a length of picture wire between the two tabs, leaving just a slight amount of slack. My knot-tying skills are not exactly Boy Scout level, and I don’t always trust my knots, so I added a drop of super glue to each knot. Reinforce, reinforce, reinforce! To keep my spice rack stable, I hung it from two hooks hung side-by-side, several inches apart. Fill it with your favorite herbs and spices and enjoy your handiwork! Thanks for the Spice Rack plans! Very nice… I’m into shadow box’s with Air Plants..thinking those just might work too.